Magenta dahlias, crimson poppies and buttercup yellow pansies mingle with lush vegetation that seems to be escaping from a labyrinth of immaculate stripes. And with them, plates, serving dishes, sugar bowls and treasure boxes take on a thousand different hues. 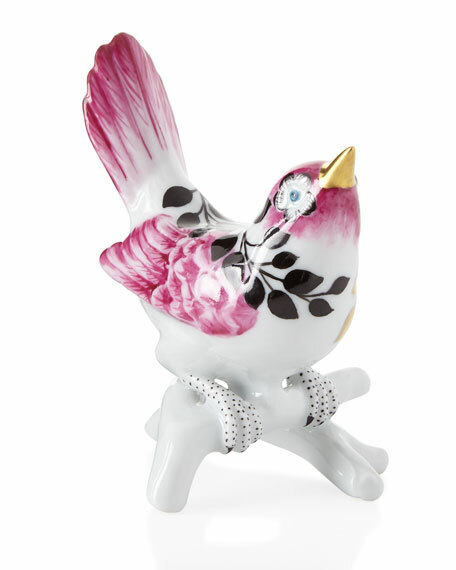 And, for the first time since their partnership began in 2013, this new Christian Lacroix Maison china collection by Vista Alegre includes a series of sculpted decorative birds. Selected from the manufacturer's archives by Sacha Walckhoff, Christian Lacroix, creative director, they have been mischievously turned into elegant chandeliers, salt cellars and trivets. Each piece is entirely hand-painted and accented with gold, superbly showcasing the age-old skill and expertise of the Portuguese workshops. What a beautiful way to celebrate five years of successful collaboration! Handcrafted and hand-painted porcelain bird. 3.4"L x 2.55"W x 3.7"T.
One of the most well known names in fashion, Christian Lacroix lends distinctive style to one-of-a-kind accessories. With fun splashes of color and quilted detail, Christian Lacroix shoulder bags, totes, and small goods display signature French flair.